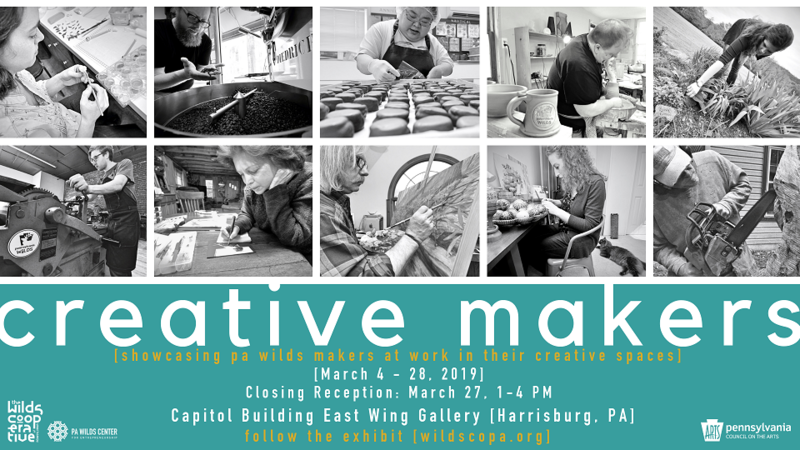 The PA Wilds Center for Entrepreneurship, Inc. and Wilds Cooperative of Pennsylvania are proud to announce that the Creative Makers of the Pennsylvania Wilds – A Traveling Public Art Show will be featured in the Capitol Building East Wing Gallery from March 4-28, 2019. A closing reception for the exhibit will be held on Wednesday, March 27, from 1 to 4 p.m. The Creative Makers of the PA Wilds Exhibit celebrates the artisans and producers of rural Pennsylvania by bringing processes that are often completed behind the scenes, in the rolling hills of the Wilds, to public spaces. The show now features about 200 images of 49 artisans, including painters, photographers, jewelry and fiber artisans, as well as woodworkers and glass artists. The exhibit showcases the breadth of skill and talent in the Pennsylvania Wilds, while also demonstrating the processes behind a finished product. Artisans featured in the exhibit are juried artisan members of the Wilds Cooperative of PA (WCO), a value chain network managed by the PA Wilds Center. The exhibit features artisans from each of the 13 counties encompassed in the Pennsylvania Wilds region, including: Warren, Forest, Elk, Potter, McKean, Tioga, Clinton, Lycoming, Clearfield, Jefferson, Cameron, Clarion and Northern Centre. The Pennsylvania Partners in the Arts (PPA) has supported this project for the past two years, helping the PA Wilds Center contract with four photographers from the region to document creative makers. So far, the show has been exhibited in five public spaces across the PA Wilds. The Capitol exhibit will be the first time it has been shown outside of the region. Details about the Creative Makers of the PA Wilds Exhibit, and how to bring the show to a gallery near you, can be found at www.wildscopa.org/creative-makers. Details about visiting the Capitol Building can be found at www.visitthecapitol.gov/plan-visit/visitor-hours-info.